About Us - Komal Health Care Pvt. Ltd. 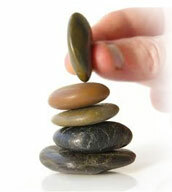 The foundation stones for a balanced success are honesty, integrity, charter, faith, love and loyalty. Komal Health Care Pvt. Ltd. as an organization built itself a foundation with each of these ingredients in perfect measure, blending to be an organization that unfailingly provides the most accurate product and services. Komal Health Care Pvt. Ltd. a leading manufacturer and exporter of surgical dressings ordently believe in the power of accuracy and have intricately weaved it in the organizational fabric, which has made this organization strong, successful and well rooted foundation. Established in the year 2003, Komal Health Care Pvt. 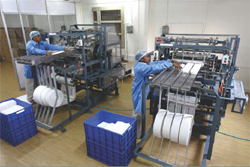 Ltd. is an offshoot of Zenium group is into manufacturing of cables and wires. Komal Health Care happened as an initiative to venture into the world of medical product and services. The organization is engaged in manufacturing and exporting of surgical dressings, Orthopedic implants, Medical packaging & Hospital disposables. Komal Health Care caters to surgical needs, hospitals, pharma, medical colleges, schools, research and development department, beauty salons, bio technology laboratories and clinical trail centres. The legendary experience of zenium group of companies blended into the forward looking virtue of Komal Health Care and in unison they gave way to an immensely successful venture. To stay ahead on the learning curve of technology and innovation and supply reliable medical products and services that enable perfect patient care. To usher in a new era of healthcare industry and in the process transform into a high performing and caring organization that generates value for its customers, employees, shareholders and society. Success for Komal Health Care isn�t a mere destination it is a larger journey that they believe need to be continually pursued. So when they peer into the future, Komal Health Care envisages yet another journey of excellence. Our immediate road map features plan to export europe and russia. With an aim of increasing sales on both domestic as well as global levels the organization focuses on the area of minimally invasive devices and thus are building an impressive range of skills, technologies and experience in that area.Innovation will be the core contributing factor to Komal Health Care�s future. The organization has flourished and attained success under the aegis of Mr. Labhubhai Goti, who is the MD & Founder. His management skills and expertise in the field of medical products has helped the organization to grow leaps and bounds and delivered outstanding performance. With his dynamism and new age thinking has induced a sea change in the organization. His futuristic thinking and knack for technology has given the organization the new age thinking and the much effective technological bent. He manages the organization entirely each and every function is regulated, overseen and driven by him. his leadership skills are truly impressive. Quality is never an accident; it is always the result of high intention, sincere effort, intelligent direction and skillful execution; it represents the wise choice of many alternatives�. Komal Health Care makes a deliberate choice of weaving quality in each an every action they take. To realize the quality control laboratory at our premises in order to keep a stringent check on the quality of the products on well defined parameters. Right from the production of components to the final step of sterilization, everything is done in house in conditions which conform to international standards. Further, we follow intensive checks at every stage of production, assembly, packing and sealing. The laboratory is well equipped with high end machines that help in conduction the necessary physical and chemical tests on the products with licence of foods and drug administration. Komal Health Care always follows the formula of QAS i.e. Quality, Accuracy and Service. 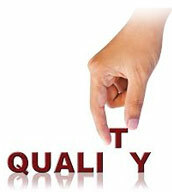 Like quality it equally gives an importance to accuracy. The highly skilled staff and a sophisticated manufacturing facility ensures the orders are completed as per the committed schedule. While one can have a perfect set-up, the set-up can only run with utmost efficacy if it has an able team orchestrating it. Komal Health Cares exhaustive set up works seamlessly and in complete synergy due to its highly qualified team of about 200 people. 150 employees are exclusively dedicated to the manufacturing unit ensuring the shop-floow functions smoothly an an additional 50 professtional and technically sound staff manage and oversee the processes. 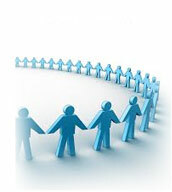 Each of them works in unison towards delighting the clientele and in turn help the company grow. Further on Komal Health Care has supplementary team of competent doctors and surgeons who design and test their products and contribute continuously for improving the efficacy of the same and making products move widelu acceptable. Human resource is the most invaluable asset and knowing so Komal Health Care ensures that this resource is well managed and optimized. the organization provides, regular skill development training to their workforce so as to ensure the team is updated, dynamic and ready for the market. What gives Komal Health Care that added edge is its fully equipped and well designed manufacturing set up, which doles out products with utmost perfection. Komal Health Care has a sophisticated, 15000 sq. ft. manufacturing set up which is developed as per the GMP standards and is equipped with the latest machines to deliver quality surgical dressings and orthopedic implants. the unit is situated in Mumbai and they have a separate corporate office. 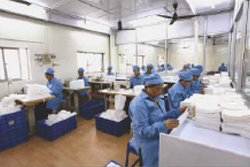 The manufacturing unit has all the facilities for effective and smooth production of our surgical dressings & hospital disposables. The machinery helps us manufacture and supply top of the line production process services. 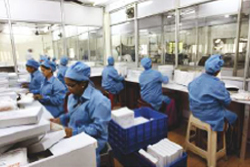 Apart from the manufacturing unit Komal Health Care also has sophisticated facilities for quality testing, research & development, storage and packaging. these functions have impeccably streamlined and thus assure swift production and post production processes.